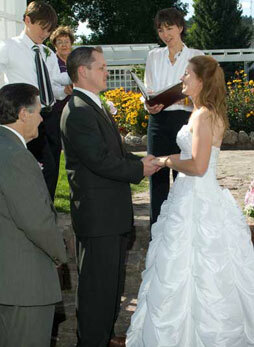 Rapid City and the surrounding Black Hills are rich with beautiful landscapes, perfect for wedding ceremonies. After leading ceremonies for more than 15 years, many of the wedding venue owners are friends of mine. It’s a pleasure to share them with you. Pro tip: Call early. Popular venues book up quickly. If possible, be flexible about your date. Off peak days are sometimes less expensive. You don’t have to “book a venue.” Depending on how many guests will be attending and how important it is to have chairs for everyone, weddings can be held in many public spaces. Choose a place that has meaning for you, that matches your vision and works for the people you wish to invite. Pretty little pull-offs, hiking trails, city parks, your own backyard, pasture, or living room are all possibilities. Please note: Some public places require permission and charge fees, so do your research. Do your own legwork, of course, but you can start by skimming this page. Then get in touch with me to talk about your vision for your special day. The ceremony meadow at Copper Canyon Lodge has a soaring rock wall with a stream meandering along the bottom as its backdrop. Gorgeous! Even better are Ruthann and Wally, the delightful and dedicated owners. The Homestead at Prairie Berry is a lovely, unique venue with indoor and outdoor space for you and your guests to enjoy. The events team works hard to take the stress out of your big day. Excellent food, award-winning wines and craft beers add to the pleasures. Choose between several beautiful ceremony sites, from outdoors at Swan Point to the shelter of the grand gazebo. The reception tent nearby is fully enclosed. Staff wedding planners orchestrate all the logistics, from party flow and guest comfort to setup and takedown. 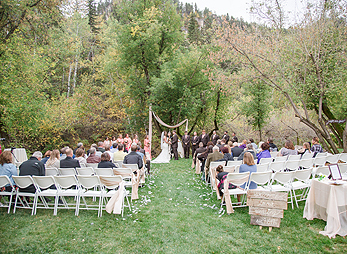 Nestled in an extraordinary canyon, Spearfish Canyon Lodge is a pretty venue in any season. Whether you are outdoors alongside Spearfish Creek or indoors beside the soaring rock fireplace, your guests will appreciate being able to stay on site to dance the night away. 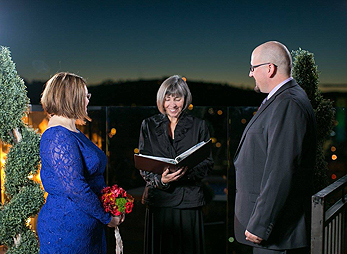 In the heart of Rapid City, the historic Hotel Alex Johnson offers beautiful spaces for ceremonies and receptions, both large and small, including a rooftop patio with a 360° view. The K Bar S is a secluded lodge (that takes care of guest accommodations!) set in a gorgeous meadow, just minutes from Mt. Rushmore. If we can’t be in the meadow, huge windows bring the outdoors into lovely indoor settings. Across a river and under the wide sky, Cadillac Ranch’s ceremony meadow is stunning. Rustic and charming, the whole property lives up to its name. This park offers several possible outdoor wedding locations, including covered picnic shelters (nice if it rains) and a small gazebo on an island in the middle of the lake. Just off Mt. Rushmore Road and surrounded by little homes from the early 1900s, this park has a large gazebo offering shade or shelter in inclement weather and a formal garden set well away from the busy road. The garden overflows with flowers in summer. Custer State Park is a jewel in the Black Hills, and out-of-town guests will definitely want to make a visit. While there are many possible locations for a small, informal wedding ceremony – alongside the lakes, in the picnic grounds, at the overlooks and even the fire tower at Mt. Coolidge – most weddings are held at one of the lodges within the park. 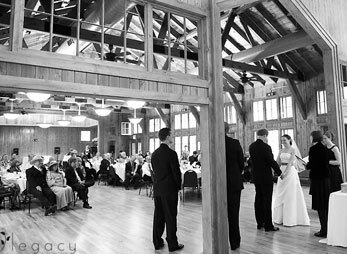 Each lodge has lovely indoor and outdoor spaces for the ceremony, room for the reception, plus all of the amenities most couples desire. 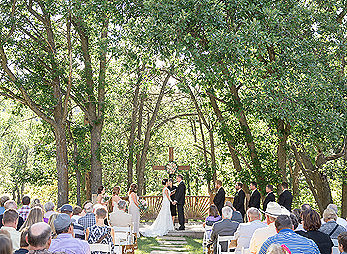 Bluebell Lodge has an outdoor chapel nestled among the pine trees and granite rocks, and a separate reception room. Next to the Game Lodge is a gorgeous pavilion with open sides, a high ceiling and a rock fireplace wall, perfect for a reception. A deck, adjacent to the pavilion (above), is sheltered by trees. If it rains (and rain on your wedding day is said to be good luck), you can move the ceremony into the pavilion. A large rock patio attached to the Sylvan Lake Lodge can be rented for weddings. A small deck overlooks the lake and is perfect for more intimate groups. Most popular is holding the ceremony lakeside because the backdrop is unbeatable, often including ducks and an occasional canoe or paddleboat. The auditorium, built by the WPA in the 1930s and beautifully remodeled, makes an outstanding reception site (and a back-up ceremony site, when the weather is damp or cold). Custer State Park Resort Company manages all the amenities (except the campgrounds) in Custer State Park. Contact them for more information about any of the lodges featured in this section. Highway 14 meanders through Spearfish Canyon, and it is one of the prettiest drives in the Black Hills. Roughlock Falls belongs to the State Game, Fish and Parks and there are several viewing decks where small ceremonies can be held. Spearfish Falls is just a mile from Roughlock Falls. 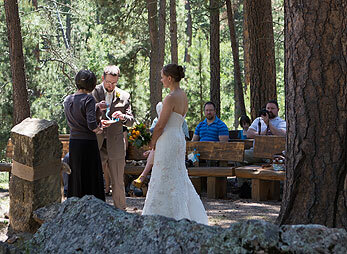 A short walk down a dirt trail takes you to a deck at the base of the falls, perfect for small ceremonies. Ruby’s Garden, on the grounds of the DC Booth Fish Hatchery, is a nostalgic, romantic spot for an outdoor ceremony, featuring an oval lawn bordered by landscaped flower beds. Need more ideas about wedding venues in the Black Hills? These are the photographers who took the beautiful photos you see of the locations listed above. If you are still looking for a photographer, take a peek at their websites.